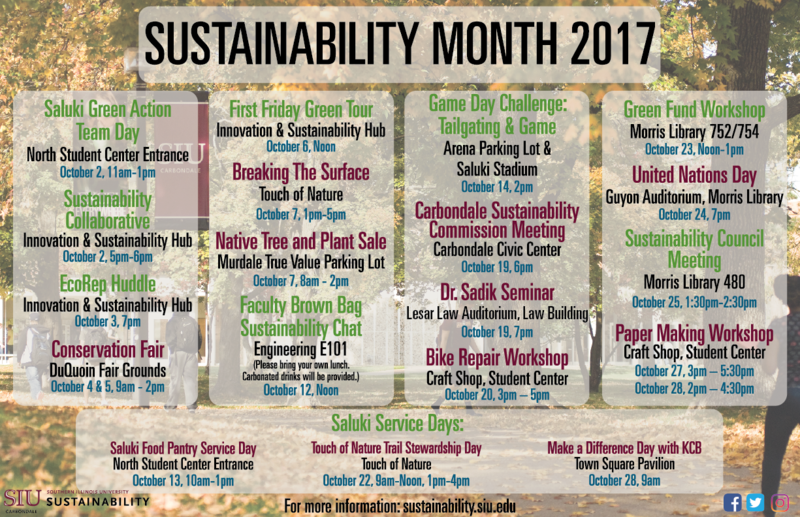 SIU is proud to participate in the Campus Sustainability Month throughout October. This annual event, hosted by the Association for the Advancement of Sustainability in Higher Education (AASHE), celebrates higher education sustainability achievements on campuses while raising awareness of the value of sustainability in higher education. We are on air! Listen to our Sustainability Coordinator share details about the Sustainability Month on WDBX's Talk with Les & Gar - Monday Oct. 8, the Community Radio for Southern Illinois! We are teaming up with SIU Edwardsville to form the SIUnited team. Join us by signing up and setting goals for actions to take. Earn points along the way! Help SIU go green one office at a time! Commit your office to incorporating small steps that will contribute to campus-wide energy conservation and waste reduction. You will work with a student SLEUTH to create a plan that fits your office. Registration is open! The Sustainability Council at Southern Illinois University provides recommendations and advice related to sustainability policies for the SIU campus. The Council is composed of nine members: three students, three faculty, and three staff, who are committed to advancing sustainability efforts on campus. Members apply to serve on the Council where they guide the vision of sustainability for SIU and make decisions regarding Green Fee distribution. Find Pokemons while assisting the Office of Sustainability collect valuable data on waste reduction. A solar powered phone charger will be raffled off at the end of the week! Email joel.hamilton@siu.edu for more details. Email “join” to 618pogo@gmail.com to sign up. Stop by our tent to talk sustainability and enjoy a slice of pizza! A Swedish fitness craze! "Plocka" up waste while jogging! Cost: Free to regional educators (college/university)RSVP: email Geory Kurtzhals, SIU Sustainability Coordinator at glkurtzhals@siu.edu by October 7th to confirm your spot in the class. Include your name, institution, and educational focus. Bring: a reusable drink container, a name tag (if you already have one), and a project (new course, assignment needing revision, etc.) to focus your efforts. Help build TON'S new multi-use mountain bike trail. Bring a water bottle, long pants, and close-toe shoes. TON will provide tools, gloves, protection and Papa Johns Pizza for lunch! Email tonec@siu.edu. 180 local 4th grade students come to campus for a Tree ID walk and demonstrations of tree climbing and timbersports! Event hosted by Tree Campus USA and put on by volunteers from the Forestry department. SIU Athletics and the Office of Sustainability have teamed up to reduce waste at ALL home football games this fall! Each game, our volunteers encourage recycling efforts in the tailgating areas and stadium by passing out bags for recyclables, providing gentle reminders, and more! Sign up for the Homecoming game on October 20. Happening Oct. 20. Neighborhood Co-op Grocery will host the Annual Empty Bowls event with SIU Ceramics. SIU students create beautiful bowls that are sold to raise money for Good Samaritan House of Carbondale. Empty Bowls is a worldwide movement that brings awareness to fighting hunger. In support of this mission, the Co-op will donate free soup to everyone who purchases a bowl. Get to know the geography of our campus while winning prizes! View details here. For more information contact Audrey Wagner at audreyw@siu.edu. Enjoy local food and farmers at the Fall Farm to Fork Feast! Check out the menu and purchase your tickets today! Join the Greyhawke Gamers Guild for a sustainable themed game night! Games include: Catan; Coldwater Crown; Photosynthesis; Eco-Fluxx. The Office of Sustainability and the LGBTQ Resource Center are collaborating to celebrate gender expression and waste reduction! Have lightly-used clothing that no longer represents you or just don't wear? Don't throw it away! Bring it to the clothing swap and trade it for something that expresses who you are! 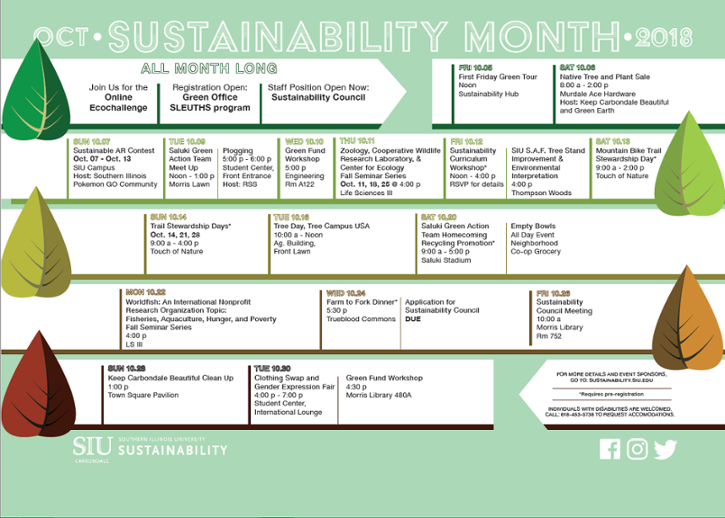 To celebrate, the Sustainability Office has created a month-long calender of activities that you can get involved in. Don't forget to use #SIUSustainabilityMonth in your posts! We hope you will join as we celebrate our sustainability successes! Thank you to campus and community members who submitted events for our calendar! Join us at Saluki Stadium and in the tailgating areas as we promote recycling. Learn to fix your own bike, brakes, flat tires, Adjust or replace shifting cables, tighten bearings, true wheels. The bigger the class the more repair items we can learn from. Bring your bike. Use recycled and nature found materials to make one of a kind art paper. Great for special occasions, printing, stamping and other crafty endeavors.